DiskWarrior has been one of the most important Mac utility programs since version 1.0 first shipped in November 1998. That original version supported Macintosh System 7.1 through Mac OS 8.5. It quickly became the standard for fixing damaged directories, and I've been using it since version 2.0. And now version 4.0 is out, the first to support Intel Macs. DiskWarrior is not only a powerful tool, but a cleverly configured one at that. Alsoft has figured out how to make the DiskWarrior CD boot into a supported version of the Mac OS determined by the computer you're using. Clever, and invaluable when supporting multiple Macs. In other news, Matrox has dual- and triple-head video adapter for Intel-based Macs, and ScreenRecycler lets you use almost any old networked Mac or Windows PC (so long as it can run VNC) as an extra monitor with your OS X computer. Clever, although the additional screens may update slowly. DiskWarrior is a safe, technologically advanced, powerful utility to eliminate directory damage available for any computer. DiskWarrior uses a different approach to disk directory repair than other programs. The first thing DiskWarrior does is scavenge your original directory to find all the file data it can. It then uses this data to build an entirely new replacement directory. DiskWarrior is the only product that finds all of your data. Its patent-pending method always results in a perfectly rebuilt directory without any errors and that contains all of your file and folder data. DiskWarrior is designed from the ground up with a totally different approach to preventing and resolving directory damage which is the leading cause of Mac instability. DiskWarrior resolves existing disk damage by rebuilding your disk directory using data recovered from the original directory, thereby recovering files and folders that you thought were lost. The directories DiskWarrior creates are also optimized for maximum directory performance. DiskWarrior is not a disk repair program in the conventional sense. It does not attempt to solve all of the possible problems that can occur with a disk. It specializes in eliminating directory errors - the most common problems Mac OS users have with their disks. DiskWarrior rebuilds your disk directories making them error-free, eliminating any problems the errors would have caused, and recovering lost files. It fixes any problem with master directory blocks and alternate master directory blocks (HFS), volume headers and alternate volume headers (HFS Plus), volume bitmaps, catalog trees, and extents trees. This approach has a significant advantage that the others overlook. Other products attempt to repair your directory one step at a time, ignoring the big picture of what is truly wrong with your directory, and risking file information that could be saved. Too often, they will incorrectly begin to "repair" your directory, and then give up when they realize that they have modified the directory to an irreparable state. At Alsoft, we know that the most important thing when you are attempting to repair your disks is getting your data back. That's why the first thing DiskWarrior checks is your directory data, and that's what it uses to create a replacement directory. DiskWarrior continues its rebuild operations unless no directory data can be found. Directory damage isn't the only threat to your data. A physical hardware malfunction can cause intermittent loss of access to any data on the drive. If the malfunction is serious enough, the only way to retrieve the data on the drive is through an expensive data recovery service. DiskWarrior can be configured to automatically check drives for possible drive malfunction, giving you the chance to back up your data before a drive completely fails. The hardware monitoring can also be run manually if you suspect a drive malfunction. Alsoft has been making disk utilities for the Mac over 20 years. Our disk optimization utilities have always chosen the safety and security of your data over anything else, and have been able to detect and report directory errors no other program can (the others obviously couldn't fix the problems they couldn't even find). That knowledge has been put into DiskWarrior to give you the only tool that can eliminate all directory problems and recover lost files and folders! And, as an added bonus, the directory DiskWarrior creates is optimized for maximum speed when accessing your files! Universal binary - DiskWarrior 4 works on both PowerPC and Intel Macs. Repairs invalid file permissions - No need to run more than one utility. Repairing permissions and repairing directory errors are the two most common disk maintenance procedures. Includes an additional suite of file and folder tests - Finds problems before they cause you trouble. Identifies corrupted preference (.plist) files - A bad preference file can wreak havoc. Now you don't need to reset all your preferences because a single preference file is bad. Recovers more data from drives with hardware malfunctions = Recover your important files from most failing drives, possibly saving you thousands of dollars in professional recovery costs. Repairs and rebuilds FileVaults - FileVaults suffer from directory damage too. DiskWarrior is your only choice if you need the data security of a FileVault. Repairs and rebuilds disk images - Get back the files you thought you had safely tucked away in a disk image. Fully supports case-sensitive file names - If you use case-sensitive disks then DiskWarrior is your best choice. Repairs and rebuilds Attribute B-trees - First introduced in Mac OS X 10.4 (Tiger), Attribute B-trees are a new addition to the disk directory. DiskWarrior rebuilds them as easily as it rebuilds the original catalog and extents B-trees. Repairs Access Control Lists (ACLs) - ACLs are a new permissions model first supported in Mac OS X 10.4. DiskWarrior repairs them too. Please note that to install DiskWarrior 4, your Mac must start up in Mac OS X 10.3.9 through 10.4.x. This is a change from DiskWarrior 3 which supported older versions of Mac OS X.
DiskWarrior supports any Mac OS Standard (HFS) or Mac OS Extended (HFS Plus) disk including RAID volumes, journaled disks, case-sensitive disks, FileVaults, and iPods. DiskWarrior requires a G3 Mac or better (such as a G4, G5 or any Intel processor) with built-in FireWire and a minimum 256 MB RAM (512 MB recommended) to start up and run from the DiskWarrior disc regardless of what operating system is installed on the disk to be rebuilt. To install, you must be started from Mac OS 10.3.9 or later. If you plan to rebuild the directory on your startup disk, you need to start up from another disk capable of starting up in Mac OS X 10.3.9 through 10.4, such as the DiskWarrior CD. DiskWarrior cannot be run while started up from the Apple Mac OS X install CD. If you wish to enable DiskWarrior's automatic hardware monitoring, you will need to install the DiskWarrior application on your Mac OS computer. To install the DiskWarrior application, you must have a Mac OS computer running Mac OS X 10.3.9 through 10.4.x with at least 256 MB RAM. Installing DiskWarrior is not required to run the application from the DiskWarrior CD to rebuild a disk directory. If you Mac is running Mac OS 9.2.2 or earlier, DiskWarrior 2.1 is still available for purchase directly from Alsoft. US$49.95 upgrade, $99.95 full version. PR: Now Mac users can benefit from Matrox's multi-monitor expertise with the award-winning Matrox DualHead2Go and TripleHead2Go products. 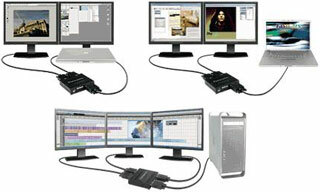 DualHead2Go and TripleHead2Go are palm-sized boxes that connect externally to the VGA output of compatible Mac notebooks and desktops, uniquely allowing users to attach two or three monitors to their systems, creating an incredible multi-monitor environment. With DualHead2Go, home users can use iLife for multimedia projects on one monitor and organize and play iTunes on the second monitor, while corporate professionals can employ both email and Microsoft Word or Excel simultaneously without having to constantly toggle between applications. Upgrading your system with DualHead2Go or TripleHead2GoÝ will provide a larger viewing area which is ideal for digital content applications. Creative professionals using animation or video editing applications are now afforded ample onscreen desktop space with three monitors for the placement of multiple UI elements (viewports, image windows, toolbars and dialogs). Audio editing professionals can also benefit from extended desktop space, as they can stretch tracks, and place effects and mixers across all three displays for the complete digital audio editing workstation experience. A complete list of compatible Mac systems is posted on the Matrox website. Ý To install TripleHead2Go on your Mac system; you will need to install the "Image Adjust" applet, which is available for download on our Web site here. * Note that the maximum resolution that is supported is system dependent. See the Mac system compatibility list for details. PR: Recycle your old iMac, PowerBook, or even Windows PC. Most Mac users have a spare computer sitting right next to their main computer on their desk. ScreenRecycler now enables you to use this spare computer as second display for your Mac. You can even use an idle machine for that purpose. Just start ScreenRecycler on your Mac and connect to ScreenRecycler via VNC from your old machine. Added maximum hextile degration preference - this enables you to set the maximum level of picture degration when the picture is changing a lot. Virtual display now shows up with name. prerelease expires now mid January. PR: The Belkin Cable-Free USB Hub, the industry's first USB Hub that doesn't require a cable to connect to the computer, will be available for purchase in mid-December. Utilizing Ultra-Wideband (UWB) technology with the Wisair chipset, this hub allows you to place your laptop anywhere in the room so you can print, play music, scan, download photos, and burn CDs from anywhere in the room. Available in mid-December, with launches in Asia, Europe, and Australia to follow at an indefinite date, pending respective country's regulatory approvals. 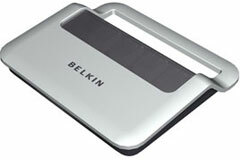 Available at Belkin as well as through a network of major distributors, resellers, and superstores. 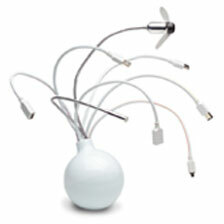 PR: Experience the art of connectivity with this fun, stylish USB & FireWire combination hub for your PC or Mac. Designed exclusively for LaCie by Ora-•to, the Huby's round shape, glossy white polycarbonate finish, and flexible cables give it a distinctive, modern look. 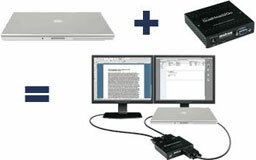 Add 4 USB ports and 2 FireWire ports to your computer system and connect up to six devices simultaneously*. 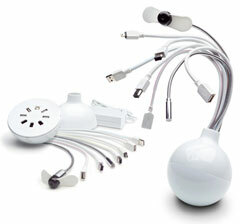 Bundled with 8 flexible, twistable cables (5 USB 2.0 & 3 FireWire 400), a USB fan, a USB light, a USB extension cable and a FireWire 400 extension cable, it comes fully equipped for easily making all of your connections. PR: Apricorn has announced the availability of the 80 GB capacity Aegis Mini, a pocket sized, ultra-portable 1.8" external drive with USB 2.0 or FireWire connection options. Compatible with both PC and Apple systems, Apricorn's Aegis Mini is now available in 30 GB, 60 GB and 80 GB capacities. The hard drive is bus-powered and features a convenient, integrated USB 2.0 or FireWire cable, which wraps neatly around the Mini when not in use. Aegis Mini weighs in at a mere 3.5 ounces, is smaller than a deck of cards, and is plug-n-play and hot swappable. The product is bundled with Apricorn's Data Protection Suite, which provides backup, synchronization and encryption and has a rugged shock mounted enclosure. Hardware: Pentium CPU, Apple G3 or later, 32 MB RAM, USB, FireWire, CD ROM. Apricorn's Aegis Mini is currently available in the US, Canada. and online. PR: FastMac has expanded it's popular "Just Say No To Crack" iPod rehab program featuring same day LCD replacements for Video iPods and Nanos to now include 4th Generation (Click Wheel) iPods. The program offers repair and replacement of scratched or cracked iPod LCD screens, either as a Do It Yourself (DIY) kit with tools & instructional videos or via a same day mail order service provided by FastMac directly. FastMac uses only Apple original parts to guarantee quality as well as fit and compatibility. FastMac's iPod LCD rehab program is available now for the iPod 5th Generation with Video, iPod nano, and iPod 4th Generation (Click Wheel) with special introductory pricing that starts at $29.95. Each screen carries a 1 year warranty and a 30 day money back guarantee. FastMac's LCD rehab program replaces the iPod's original display with a 100% matching Apple original part & includes all necessary tools and instructions required to open the iPod. 24-hour installation services are also available for an additional $39.95. Using a box in the mail service provided by DHL, FastMac will pick up the customer's iPod, install the LCD screen and provide a thorough checkup & light cleaning before shipping back to the customer, all within 24 hours. During the rehab process, FastMac will diagnose any other problems that the iPod may be experiencing, and offer a free estimate for repair or upgrade, including battery & hard drive upgrades, or logic board repairs. "We've had such a great response to this program that it was a no-brainer to expand it," said Michael Lowdermilk, Business Development Manager for FastMac Performance Upgrades, Inc. "We're working hard to include even more iPod models and should have more available by the first quarter of 2007." FastMac's LCD rehab program can also be combined with a TruePower battery upgrade to obtain an almost new iPod. FastMac's TruePower battery upgrades replace the iPod's original internal battery with a larger capacity and longer lasting advanced power cell battery. The upgrades offer 20-78% more capacity than the original OEM battery and up to 7.5 times as many charge cycles. FastMac's LCD rehab program is available for the iPod 5th Generation with Video (2005 model), iPod nano (2005 model), and iPod 4th Generation (Click Wheel). More information about the "Just Say No to Crack" LCD rehab program is available online.